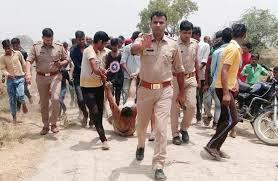 Qasim (45) was beaten to death by a mob at a sugarcane field in Hapur’s Pilakhuwa and 65-year-old Samiuddin was injured in the incident. Police have arrested two men — Yudhishtir Singh and Rakesh Sisodia — on the charge of murder. According to the FIR filed at the Pilakhuwa police station, the incident was the result of a scuffle between unidentified bike-borne men and the two victims. But the family of Samiuddin and the two men arrested insisted that it was related to “cattle”. Qasim, according to his family, had received a phone call hours before the incident at around 11 am Monday. “He was at home yesterday and he left immediately stating that he will be back by 4 pm. He took around Rs 60,000-70,000. We had asked him to not leave in a hurry and to return quickly. He used to go to neighbouring villages to procure and sell cattle and we thought that it must be regarding his business,” said Qasim’s daughter-in-law Arshi. A few hours later, two men had hurried to Qasim’s house to inform the family that he had been rushed to the hospital after he was mercilessly assaulted around five km away. A video has also surfaced that shows Qasim lying in a field, his clothes torn and bruises across his body. In the video, Qasim pleads for some water as a group of young men stand in the background. A voice asks people to calm down since they have already beaten the man and requests the mob to give Qasim some water. Soon after, another person is heard saying that cows were tied in the fields for slaughtering. The incident took place between 12 pm and 1 pm on Monday in the sugarcane fields that divide two villages in Pilakhuwa — Muslim dominated Madapur and Thakur-dominated Baghera Khurd. Qasim is a resident of Saddikpur, which is five km from Madapur.